Posted: March 25th, 2009 under Dxpedition, Hamradio, Movie. Another DXpedition video is on it’s way. These are the kind I like to see. I have seen plenty of them, and they always make me wanna go on another DXpedition myself. An OJ0LA video was produced after our last visit in 2006, but it is nothing compared to a dvd production like this. Other DXpedition dvd’s kan be ordered at K4UEE’s page. Bob K4UEE and Ed W4ZSB will produce yet another exciting DXpedition video. 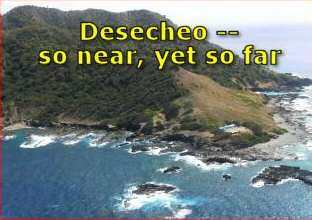 In the tradition of previous video productions, the K5D Dxpedition video, entitled, "Desecheo—so near, yet so far" will be full of exciting footage of the helicopter trips, the island from the air, camp set up and takedown, pileups you won’t believe and of course an inside look into the logistics of a big DXpedition, interviews with key team members and of course, humor. The video should be ready by September 2009 and will sell for $25.00. But by ordering now, you reserve an early copy of this collectors’ item at a discounted price of $22.00. As always, this includes shipping and handling. To reserve your copy, click HERE. Come on brother you know you don’t need to watch a video to make you want to go on another DXpedition. My hunch is that you are ready to go all the time. Heh! I know I am! The video just makes the desire worse!